PUT BARNS ON THE KANSAS MAP! 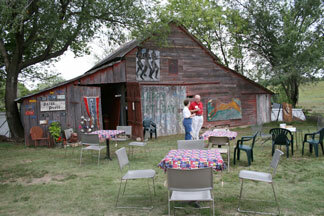 To support Kansas's Sesquicentennial birthday in 2011 and to honor barns, the Kansas Barn Alliance is encouraging each county to have at least one barn painted with a sesquicentennial logo painting sometime during 2011. The whole idea was launched at KBA board member, Susie Haver's, barn near Concordia and a protype was painted on her barn. Dexter by artist Kerry Unrein. Kerry painting from the cherry picker The finished product! The logo can be painted on a barn roof, side of a barn, or applied temporarily to the barn. The logo must be visible on the barn through 2011. It's preferable that the logo be painted in a location so that the public does not have to come on private property to view it. However, if you're willing to erect a sign that welcomes people onto your property for viewing, that would be fine. Any addition to the official logo that symbolizes the heritage of the county is welcomed. We'd appreciate seeing it first. E-mail Sally Hatcher at sdhatcher@kc.rr.com. It is preferable that the barn logo be done by Kansas Day, January 29, 2011. Here is the barn logo for Grant County! The project can be done by a single barn-owner, a family, a city, a county, or an organization. The key is a willing barn owner! 2) At anytime, send the KBA a digital photo of the barn prior to the logo painting. This will be posted on the web by county or town. 3) Let the KBA know who your artist is, sponsor (if you have one and would like the sponsor noted), and any times that the public can come watch the logo being painted. 4) Notify KBA of completed project and send digital picture. WHERE ARE THE BARN LOGOS? This website will be updated as barn logos are finished. The page will show a picture of the barn logo(s), will give directions, and tell a little bit about the barn. Funding is the responsibility of each individual project. You are welcome to apply for grants. Do check with the Kansas Arts Commission.